NEP Australia made history this weekend when the Andrews Production Hub in Sydney produced its first live broadcast for Fox Sports Australia: a Football Federation Australia A-League match in Perth between Perth Glory and the Central Coast Mariners. “Perth and Sydney are 4,000 kilometers away so it’s a pretty significant milestone, especially as we are using SMPTE ST-2110 [for the IP transport of the video and audio signals],” says Mac Segar, NEP Australia, director of technical services. 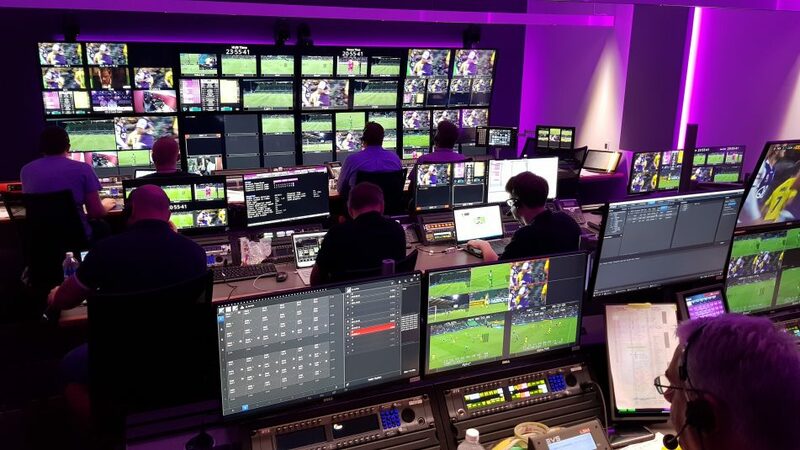 The Fox Sports Australia production team for a football match in Perth produced the match from a control room that was in Sydney, 4,000 kilometers away, this past weekend. The Andrews Production Hub currently consists of four production control rooms in Sydney that officially went online during the middle of February. In May three additional control rooms, located in Melbourne, will also come on line. The Andrews Hub project began in August, 2016, when Fox Sports Australia put out an RFP for centralized production facilities. NEP won the contract in early 2017 and from that point on began a sprint to not only construct the facilities but also sort out equipment and technical decisions. The most daunting decision was a commitment to the SMPTE ST-2110 standard because the standard itself was not ratified until last fall. But key manufacturers, like Lawo, Sony, Ross, EVS, and others, worked hard with the NEP team to begin testing of 2110 workflows last May. Each control room in the Hub has a Sony XVS8000 production switcher, a Lawo mc²96 audio console, RTS intercoms, EVS replay systems, and a Boland true-UHD monitor wall. For the March 10 match a 40-foot all-IP production truck was rolled up outside of the stadium (the truck can do a 16-camera show on its own) with camera operators and an audio A2 on site along with the announcers. Uncompressed video and audio signals were sent from Perth to Sydney via a 50 Gbps Telstra fiber so that the production team (comprised of a producer, director, TD, EVS replay operators, graphics operators, camera shaders, and the A1 audio mixer) at the Andrews Hub could cut the show. Not all productions will make use of uncompressed signal transport. Seven venues only have 10 Gbps connectivity so VC2 compression will be required. The reason NEP built control rooms in Sydney and Melbourne is that the production personnel who will work at the hubs are located in each of those cities. Sydney is home to the production professionals who work on rugby and football while Melbourne is home to the production teams that cover cricket and Australian Rules Football. “We have redundancy across the two sites as they are connected together and share all of the resources,” says Segar. The move to a centralized control room will be a big shift for crew members who are typically used to being road warriors. But the benefits, not the least of which are the ability to sleep in one’s own bed, see the family, and leave the stress of travel behind, holds many potential benefits that extend beyond simply cost savings. Crew members will also be able to work on new sports and things like staff training will also become much easier.